After you’ve decided that your elderly loved one needs a caregiver, you’ll need to decide whether to hire an independent caregiver or work with a home care agency. We’ll explore the pros and cons of either approach so you can understand the differences between private and agency caregivers. A private caregiver must be employed by the family without any intermediary agency. Private caregivers usually provide non-medical care, except in very rare cases. Personal Selection: When searching for a private caretaker, you have full control of the entire selection process. However, you have this control but with less of the work when you choose Active Home Care, as we send caregivers for free interviews with clients. Lower Cost: You can negotiate a lower salary for the caregiver and determine how much you’ll pay as well as the terms of payment. One-on-One Relationship: While it’s possible to develop a stronger and long-lasting relationship with a private caregiver, you can also develop long-lasting relationships with home care agencies or nurse registries. We have many clients who have had the same caregiver for years. Hiring Is Time Consuming: No matter how well you search and how many referrals you get, finding a reliable and experienced private caregiver is a very difficult process. Many clients don’t even know what makes a great caregiver, so it’s difficult for them to find one. Private Professionals Are Scarce: Most of the professionally trained caregivers that can offer medical care do not work as independent caregivers. Hidden Expenses: You must treat your caregiver as an employee, so you need to manage payroll logistics, comply with IRS regulations and pay various taxes. Responsibility for Liabilities: You must bear the cost of all work-related injuries and accidents. This means you need to pay for liability insurance. Backup Plans Are Needed: Caregivers work hard, and they could get sick or need rest at various times. When this happens, you must have a backup plan to get someone to take care of the recipient. Home Care Agencies and Nurse Registries are licensed to refer caregivers to provide in-home care. They recruit and professionally screen caregivers who are sent to the home of your elderly loved one. 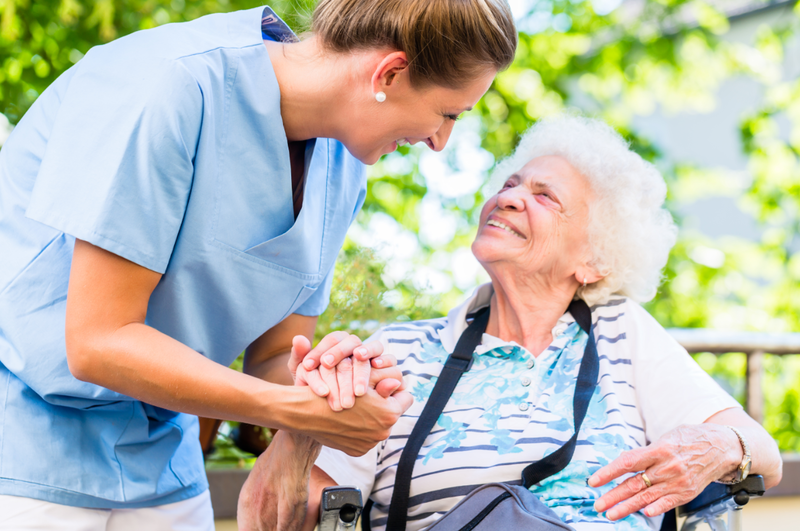 One of the main benefits of hiring a home care agency or a Nurse Registry versus private caregivers is that a home care agency can provide both medical care, through professionals like nurses and nursing assistants, and non-medical care such as meal preparation, eating, bathing and assistance with mobility. Large Pool of Caregivers: Agencies recruit and hire different types of professional and non-professional caregivers, so there’s a constant supply of experienced caregivers to take care of your elderly loved one. Background Checks: Agencies know the important characteristics of caregivers. So they can take the responsibility for medical examinations, drug screening, background checks and verification of licenses and qualifications so you can receive a caregiver into your home with peace of mind. Minimal Paperwork: You don’t need to get bogged down with endless documentation and filing of employment and tax papers. Liability Reduction: Agencies insure all their caregivers, so you don’t need to pay for liability insurance to cover damages, injury or theft. No Need for Contingency Plans: If a caregiver falls sick, another person will be available to replace or stand in for them. Higher Cost: The cost of hiring a caregiver through an agency may be higher than the lower fees charged by independent caregivers. Schedules Are Defined: Caregivers provided by agencies usually work fixed schedules, so a patient may be seeing different caregivers at certain times if their main caregiver is not available during a rescheduled time. However, 24/7 care is usually available when necessary. At Active Home Care, we offer excellent in-home care services for the elderly. We provide the highest quality of care through specially trained caregivers who are carefully selected to meet the needs of your senior loved ones. Contact us or call us at 786-360-3449 now for more information about our services. We provide service in Miami and the surrounding areas, including Aventura, Coral Gables, Miami Beach, Bal Harbour, Cutler Bay, North Miami Beach, Sunny Isles Beach, Key Biscayne and Surfside.